The London 2012 Olympics website has failed to cope with the surge in traffic from frustrated users trying to buy remaining unsold tickets. The 10-day sale of 2.3 million unsold Olympic tickets began on Friday at 6am. 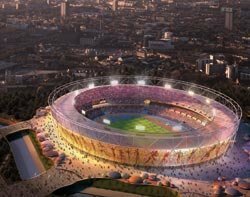 The London 2012 Organising Committee (Locog) said over 130,000 more people now have tickets with 150,000 applications processed. Around 60% of applications were submitted in two hours. But users complained of slowing loading times and error messages when trying to complete transactions. A statement said the London 2012 Olympic website was experiencing high demand. It advised people applying for second chance sale tickets not to refresh frozen browsers. The London 2012 Olympic website also experienced sales problems. "After completing the final checks on tickets available for second chance sales, we identified a small number of anomalies linked to the re-allocation of tickets from failed payments. This applies particularly to one Athletics session where tickets at one price category have been listed as 'available' when in fact they are not," said the statement. Colin Rowland, senior vice-president at business transaction firm OpTier, said the IT infrastructure failed to support the ticketing process. "When tickets first went on sale back in March, 8.8 million tickets were sold over a six-week period, but this time there's only 10 days to snap up those precious tickets and the first-come-first-served policy has led to the website buckling under pressure from huge customer demand," said Colin Rowland. Keynote Systems performance monitoring tools showed, in the first 15 minutes of tickets becoming available, site visitors had to wait over 24 seconds for the website to load. As applications for tickets for the London 2012 Olympic Games opened, some Visa card users were unable to register after a payment system glitch on the ticket website.